Timber>Adopt is a web interface for collecting and managing textbook adoptions from your faculty. Any Booklog customer who is currently using the Course Management Module can use Timber>Adopt. To request access to the Demonstration Sandbox, click here. Timber>Adopt is an easy-to-use dashboard that allows bookstore managers to assign Textbook Adoption tasks to faculty. Instructors and Faculty see only the Sections they are assigned to. They can add and remove Adoptions quickly, and approve Sections with a single click. Departmental Users are then able to confirm and manage textbook lists for their department and Bookstore Managers have the tools to manage all departments. Faculty Users manage their Sections and Adopted Materials. Departmental Users approve/update the Sections in their department. 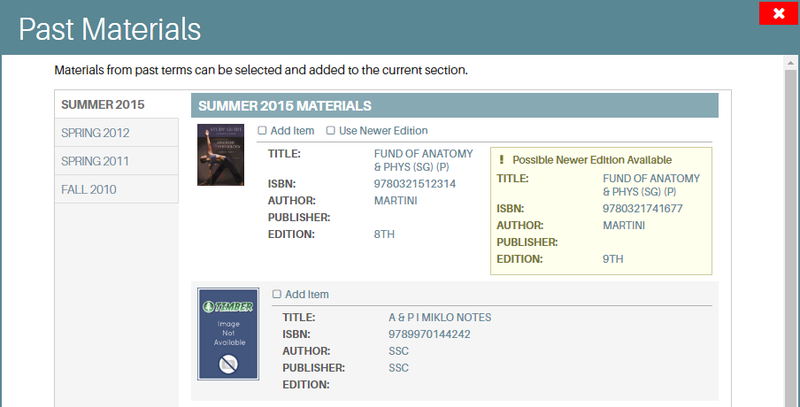 Bookstore Users manage Sections and when ready, push approved Sections immediately to Booklog. For Timber users, changes appear on your Website within 2 minutes! When it is time to round-up the unconfirmed Adoptions, Timber>Adopt includes a suite of status bars and email-reminder tools to make the process more transparent and manageable. Timber>Adopt is a web-based app: changes happen instantly without page reloads. Permissions-Based: users are only able see Sections they have permission to modify, and have not yet been approved on their level. Timber>Adopt includes progress bars, Section approval statuses, total Section counts, expanding and collapsing capabilities, click-and-drag selection, and interface tools to aid users with adoptions-management. Filters are included on each dashboard allowing users to narrow the information they want to see on the page. Very little work is required for set-up. Timber>Adopt retrieves faculty, section and user information from Booklog and automatically creates accounts with the correct level of permissions. Departments and Courses: for Department and Bookstore Users to quickly review the approved Sections in each Course. Users have the ability to select Courses, and send bulk-email reminders to Users assigned to unapproved sections. Sections and Adoptions: for Users to add and remove adoptions from their assigned Sections, and approve Sections to the next level. Users can also view materials from previous terms, and quickly add them. Approval Queue: for Bookstore Users to see all Sections awating import to Booklog. Manage Users: for Bookstore Users to set the permission levels of all other users on a Course-by-Course basis. Users can be given Department Level access, or the ability to bypass Department approval level. When a Section is approved by a Faculty User, an email is queued to the Department User to prompt them to review/approve the section. If no user is assigned to that Section's Department, then the Section moves to the Approval Queue - a dashboard for Bookstore Users that displays Approved Sections awaiting import to Booklog. All emails to users include a one-time automatic-login link, and direct links to modify each individual Section awaiting approval. Timber>Adopt User Accounts are created automatically for all Booklog Faculty Users and include their email address. An account creation email is sent to users when their account is created, along with an activation and login link. All changes made by Faculty and Department users are queued for final approval from a Bookstore User and will automatically be synced to Booklog. For Timber customers, once approved, the changes are immediately imported to Booklog, and visible on your Website within a few minutes. Timber>Adopt has an easy-to-use dashboard for your Faculty Users that only displays the Sections they are assigned to in Booklog. Faculty Users can add/remove Adoptions quickly, and Selections are approved with a single checkbox. When it is time to round-up the Adoptions/Sections that are still uncomfirmed, Timber>Adopt includes a suite of status bars and email-reminder tools to make the process more transparent and manageable. Beginning in 2018 campuses will have the option of adding on SSO (single sign-on) capabilities. Timber>Adopt users already signed into your school network will automatically be logged-in to Timber>Adopt to manage their sections.